President Recep Tayyip Erdoğan said Feb. 23 "significant progress" has been made in Turkey's ongoing talks with Russia and Iran to secure Syria's northwestern province of Idlib. "Let's secure the Idlib region completely, we say. We are talking with Russia and Iran to do that and we have made significant progress," Erdoğan said at a rally for the March 31 local elections in the southeastern Turkish province of Kahramanmaraş on Feb. 23. "At least half a million Syrians are waiting for the securing of this region to return there. Millions of Syrians will return to their homes when we secure the east of the Euphrates as well," he added, calling on the U.S. and the EU to support Turkey's efforts. 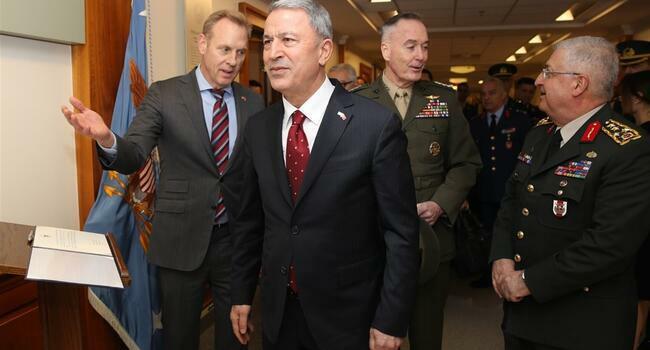 "We hope to accomplish it in cooperation with our allies. But we are keen to do it in our own capacity under any condition if they don't provide us with such a convenience," Erdoğan warned. Earlier on Feb. 23, Erdoğan was in Istanbul to break ground for a project in Istanbul that will feature science and culture centers, hotels, museums as well as marinas at the historic Haliç (Golden Horn) Shipyard. The president used the occasion to slam the main opposition Republican People's Party (CHP) ahead of the local elections, accusing them of trying to prevent the government's large-scale urban projects and investments. "We had organized the tender of this project six years ago, aiming to finish it in four years. However, we couldn't even start it for years because of obstructions supported by some chambers linked to the mindset led by the CHP. Like it always does against our investments in Istanbul and other provinces, the CHP sued this project in courts," Erdoğan said in his address. Erdoğan's ruling Justice and Development Party (AKP) and the CHP are both campaigning for the March 31 local elections. The ruling party's project -- titled Tersane Istanbul -- will positively contribute to Turkey’s tourism revenues, Erdoğan said. The Haliç Shipyard was established in 1455, two years after Istanbul was conquered by Ottoman Sultan Mehmet II. The Chamber of Architects, the Chamber of Urban Planners and the Chamber of Ship and Civil Engineers had all sued the initial government plans to open the historical, officially-protected area to construction. While hailing the project in the groundbreaking ceremony on Feb. 23, Erdoğan said it will be the largest science center in Europe where exhibitions on digital and virtual reality, artificial intelligence, maritime and shipyards, and science history will be hold. Around 30 million people are expected to visit the Tersane Istanbul when it is opened, he added. The first phase of the project is expected to open in November 2020, said the Turkish president. He said that the project will feature three museums -- including Turkey’s first women museum as well as Sadberk Hanım Museum, which will be moved from Istanbul’s Sarıyer district to the new location, and a Turkish-Islamic arts museum.